Ever since I re-discovered drugstore makeup, I've been trying out random things here and there. Some have been good, some have been bad and there have been a lot of pleasant surprises. 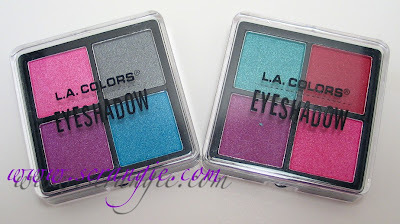 So, when I was at Dollar Tree recently, these LA Colors palettes caught my eye. And hey, for $1, I had to try them. I got four different sets: two of these dual 4-pans and two 10-pan palettes. Here's the set named Ocean Breeze (why is it named that?). The set came in a little plastic bag with these two palettes in it. After I bought it, I realized that it was supposed to come with an eyeliner, and also that these probably weren't the palettes that were supposed to be in the bag. Gotta love Dollar Tree. They're so cheap that they don't even have names or real lids. The plastic lids have to be removed, they don't swing open like a regular palette. Not a big deal, just somewhat annoying. Here are the colors in natural light. Actually, they look more accurate in the artificial light, but this accentuates how similar the palettes look to each other. Swatched dry, no primer. Pretty good payoff and pigmentation! 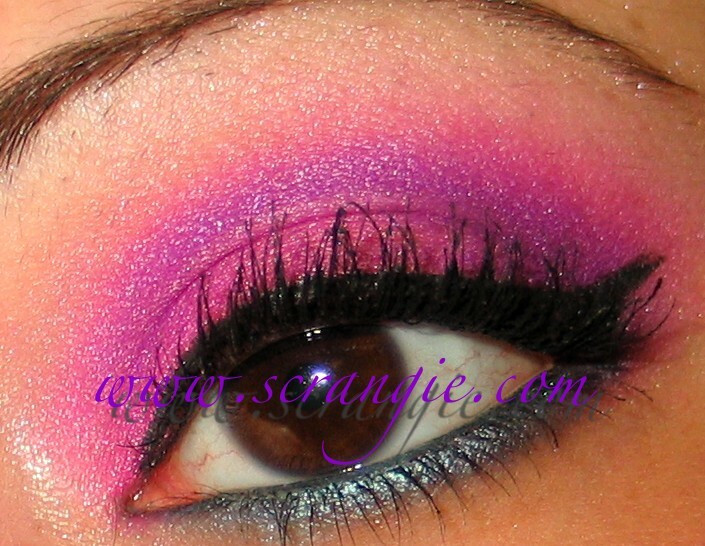 The least pigmented is the grey, the most pigmented is the hot pink. The colors in these are amazing. The hot pink is killer, the red is really nice and the darker of the purples is surprisingly vibrant. Totally worth the cost of admission. 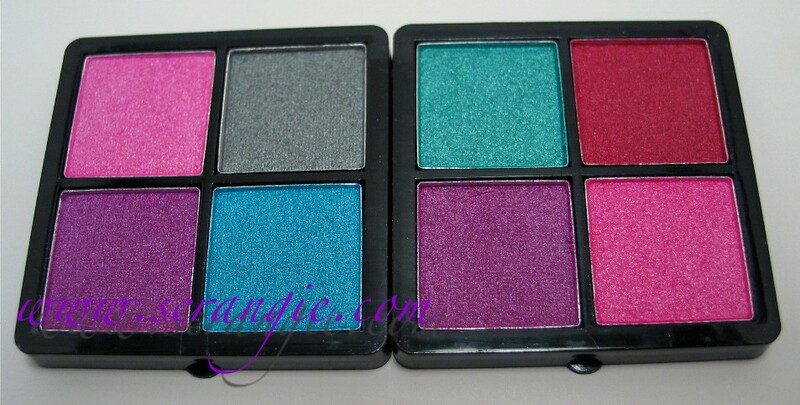 The palettes are small but the colors are bright and pigmented. I did a super fast look with these; sorry about the weird flash and fluorescent light pictures, it was already dark out when I thought to take a picture. See? Bright! 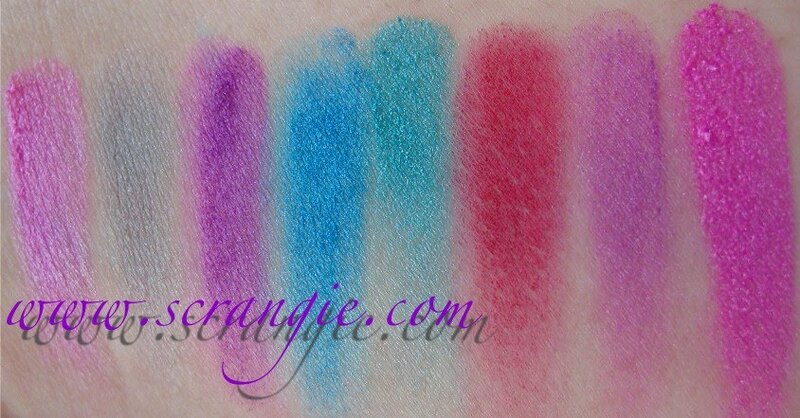 Pigmented! Very powdery and soft with a slight sticky texture like some of those really inexpensive 'value set' drugstore shadows can be. Not hard or chalky like I'm used to from cheap drugstore shadow. Now I'm excited to use the other LA Colors palettes I got. Great colors. The other palettes have different shades of red, yellow, blue, green, purple...Woohoo $1 makeup! O M G those are AWESOME!!! Now I'm going to have to go check those out lol. Great review! Oh man...I need to take a trip to my Dollar Tree...those look awesome! I'm laughing at your idea of atrocious liner. It's about five times better than my best efforts! I am surprised. I didn't think anything from Dollar Tree could possibly be good. For some reason, my local Dollar Tree gets a lot of Maybelline and Covergirl products that look as though they passed their expiration years ago. They have the LA Colors range, but I figured you'd get what you paid for. sometiems things are not what they seem at the Dollar Stores! LOL! Nice finds! 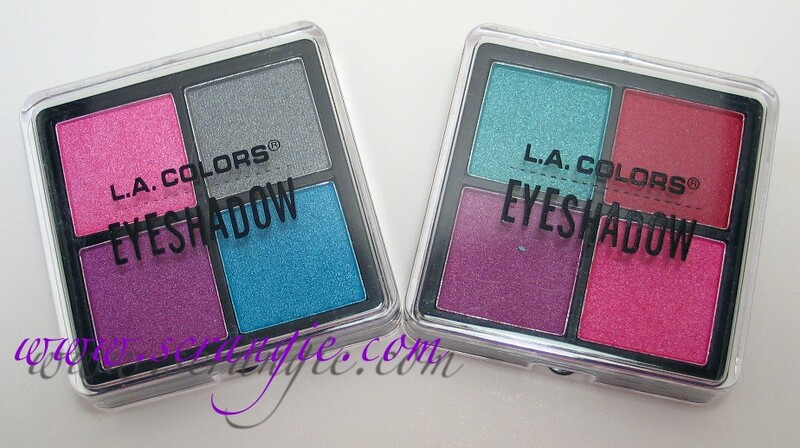 If your DT has them, check out the the LA Colors Shimmering Loose Shadows. Color payoff is VERY good and applied over TFSI they last GREAT! Did a super-quick out-the-door look with Honeysuckle, Radiant, and Sunshine last week and got more compliments (specifically on my eyes) than in a LONG time! Have had good experience with LA Colors lipsticks, though. So far I've tried a couple - Mauve Glaze and Frozen Berries. Formula, longevity, and colors of both are very nice. Both shades also seem VERY wearable by a wide variety of skintones! 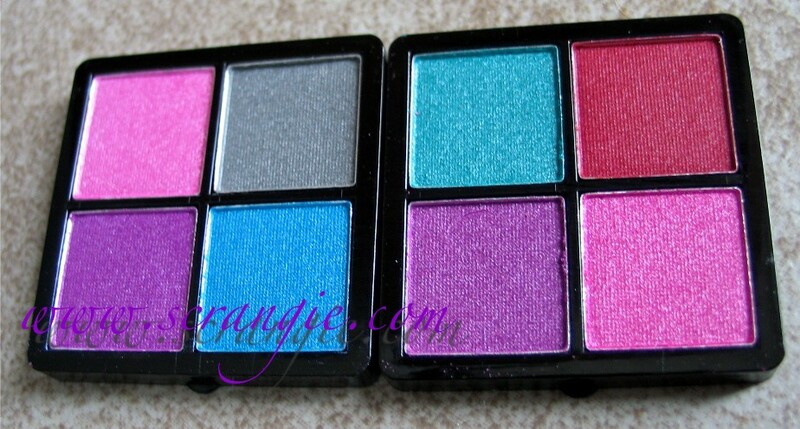 I love the 5 color eyeshadow sets. I use a brown one almost every day. oh wow they are pretty. Their pan shadows were stupid when I tried them, but I liked their loose pigments and lip gloss. I have a few nail polishes that aren't terrible, either! Are these new? I was just at Dollar Tree last week and didn't see these! Wow holy crap! That is insane pigmentation compared to what I was expecting to see. I LOVE LA COlors nail polishes. U need to try them. 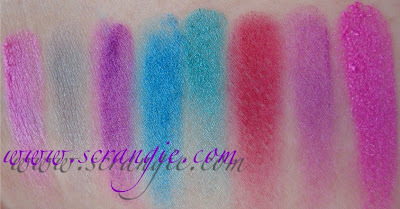 But I've tried cheap eyeshadows and usually they're either too dry (like rock hard), too chalky or not pigmented. This is a good deal. Those are really nice palettes. I hate the cheap packaging. Will keep a lookout for these.